"The cover is the Albert Watson portrait taken for Fortune in 2009. The back is a Norman Seeff portrait of him in the lotus position holding the original Macintosh, which ran in Rolling Stone in January 1984. The title font is Helvetica. It will look as you see it, with no words on the back cover." 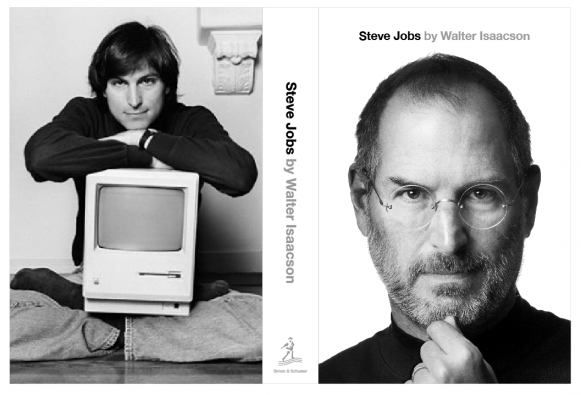 Isaacson further denied that the change in schedule had anything to do with Jobs' health, or anything other than the book being done, edited, and ready to go. Book description after the break. Although Jobs cooperated with this book, he asked for no control over what was written nor even the right to read it before it was published. He put nothing off-limits. He encouraged the people he knew to speak honestly. And Jobs speaks candidly, sometimes brutally so, about the people he worked with and competed against. His friends, foes, and colleagues provide an unvarnished view of the passions, perfectionism, obsessions, artistry, devilry, and compulsion for control that shaped his approach to business and the innovative products that resulted. Driven by demons, Jobs could drive those around him to fury and despair. But his personality and products were interrelated, just as Apple's hardware and software tended to be, as if part of an integrated system. His tale is instructive and cautionary, filled with lessons about innovation, character, leadership, and values.